Is a new home on your Christmas list this year? Then consider locking your interest rate before you start shopping and take the time you need to find just the right home for you and your family! Eliminates Rates Change Anxiety – With mortgage rates changing almost daily, locking your interest rate at the right time can make all the difference in where your final monthly mortgage payment ends up. If you’re on a tight budget, then even the smallest rate increase could mean a potential problem in keeping your mortgage payment within budget. With the Inlanta’s Lock and Shop program, you can better plan your budget and help keep your finances in check by knowing what your interest rate will be before you find your home. Have the Upper Hand – Once you’ve found your dream home, there’s a good chance in today’s competitive market that you’ll be competing with other buyers. To win the deal, you can set yourself apart from other buyers with a rate lock and a fully underwritten pre-approval that shows you’re not only ready to buy, but you’re more likely to close and the home buying process will be expedited. NO Fees! 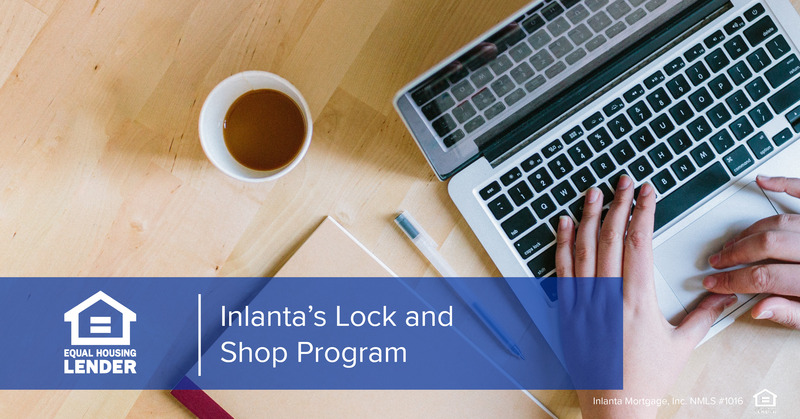 – If you’re worried about how much it will cost you to take advantage of Inlanta’s Lock and Shop program, you’re in luck! Our program offers no fees to lock and hold your rate so you can save your money for more important things – like your down payment or furniture for your new home. To learn how the Lock and Shop program could make your holiday dreams of new home ownership come true, speak to one of our expert loan officers in your area or apply today. *Lock extensions are limited to no more than 30 days past the original 72-day expiration. . Restrictions apply on locked loan amount changing and product locked cannot be changed without voiding price protection. The loan must be conventional, FHA, USDA, or VA and carry a fixed rate. The final loan amount cannot vary by more than 20% of the original lock protected loan amount. The loan program may not be changed without voiding the rate lock protection. If a property is not found within lock period, the lock is cancelled. This entry was posted in Loan Programs and tagged loan programs, lock and shop, mortgage rate, rate, Rate Lock by Inlanta Marketing. Bookmark the permalink.